2,5-fat sour cream 3 tbsp. Knead the dough, divide into 2 parts. First add 1-1,5 tbsp. flour. Each type of dough to roll out 4 tortillas and bake. About 5-8 minutes each. 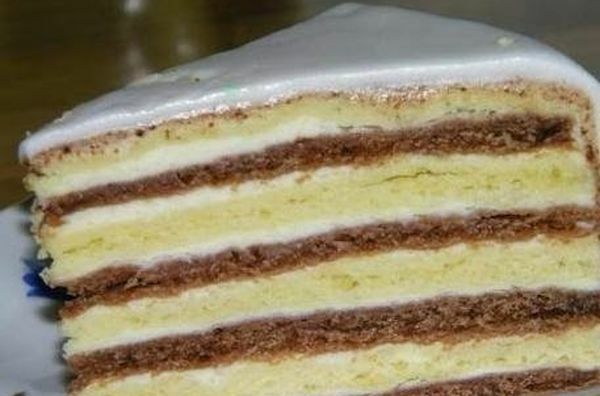 White cakes should slightly zarumyanitsya, note the time and the same will bake and brown cakes. For the cream, mix the sour cream with sugar and whip with a whisk. Finished cakes cool slightly if you need to trim the excess (I usually put the lid from the pan and cut) and while they are still warm (not hot!!!) immediately apply cream, alternating white and chocolate cakes. Optionally, you can pour the finished cake with chocolate icing. Leave on for a couple of hours on the table, so soaked and then put into the refrigerator overnight.